Belleville (MI) Belleville defensive end/defensive tackle Tyrece Woods decommitted from Michigan on Thanksgiving. Woods had committed to Michigan in the middle of August (LINK). Air Force, Cincinnati, Fresno State, Temple, and a bunch of MAC programs had offered Woods prior to his committing to Michigan, and I would assume some other programs would try to jump on board to try to grab a former Michigan commitment. 247’s Clint Brewster had put in a crystal ball for Cincinnati just a few days before he picked the Wolverines, so maybe there’s some lingering mutual interest between Woods and the Bearcats. 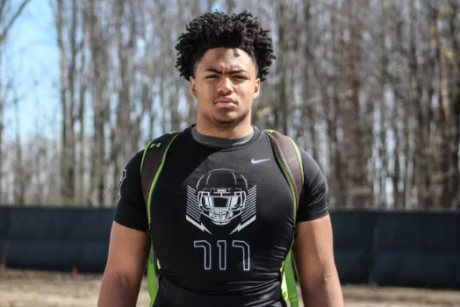 On Michigan’s end of things, there are several other defensive line recruits already committed: DE Chris Hinton, DT Mazi Smith, DE David Ojabo, DE Mike Morris, and DE Gabe Newburg. Rumors are growing stronger that Ohio DE Zach Harrison is going to pick Michigan, while Indiana DE George Karlaftis could flip from Purdue if Boilermakers head coach Jeff Brohm leaves for Louisville (or anywhere else). Woods was Michigan’s lowest rated commit by far at #1685; the next lowest is LB Joey Velazquez at #984. The Wolverines now have 25 commits in the 2019 class. This is probably best for both parties. I gave Woods a TTB Rating of 49. Michigan doesn’t have a lot of spots open, and I think Woods would end up buried down the depth chart. Now he can go somewhere where he’ll have a little better chance of playing significant time. Leaving, of course, the question of why we’re offering guys like this to begin with. Not fair to them, and does our recruiting no good. Exactly. This guy wasn’t going anywhere. And this is why the “I trust the coaches” chorus should be a little less righteous about it. In this case, it was the people who said “why are we offering this guy?” who were spot-on with their instinct. last year’s recruiting (2018 class) simply wasn’t good compared to 2016 and 2017 classes because of the 2017 season. So the staff had to throw a larger net. Woods committed this summer before our season started, and both the staff and Woods must’ve realized over time that this class is going to get a lot better because of our success this season… which was not clear back in the summer. As Thunder said, I think this is best for both parties. I am assuming a few more low 3-star types will move on as we fill up with more 4- and 5-star types. I defy you to show me a measurable correlation between quality of recruiting class and success in the previous season. What you offer is really just an excuse. And of course, if we have a really good season, the opposite excuse is offered for sub-par recruiting…that guys don’t want to come where they’re likely to be buried on the depth chart. Isn’t it obvious? We were getting blown out in several of our games… Very ugly. Winning helps recruiting, period.